Worried about a low VIX? The low volatility environment is very interesting; it is rather reminiscent of those moments in westerns when the cavalry captain says "I don't like it. It's too quiet." and immediately gets an arrow through the chest. It is possible that the first rate rise from a central bank (some people at the Bank of England are getting twitchy) may be the new displacement. Euphoria stages come to an end when insiders take profits. 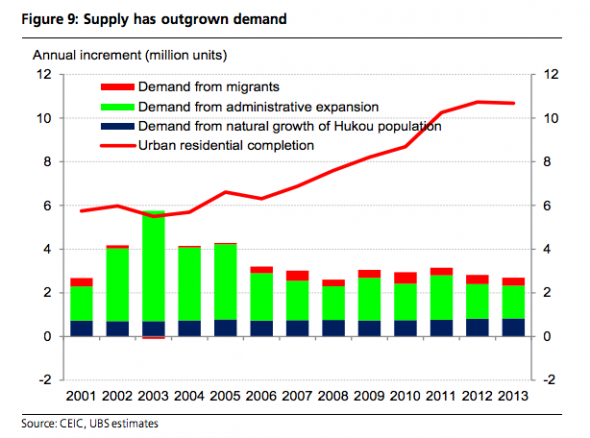 Deutsche cites this happening in farmland and Hong Kong property but one also has to wonder about tech stocks. 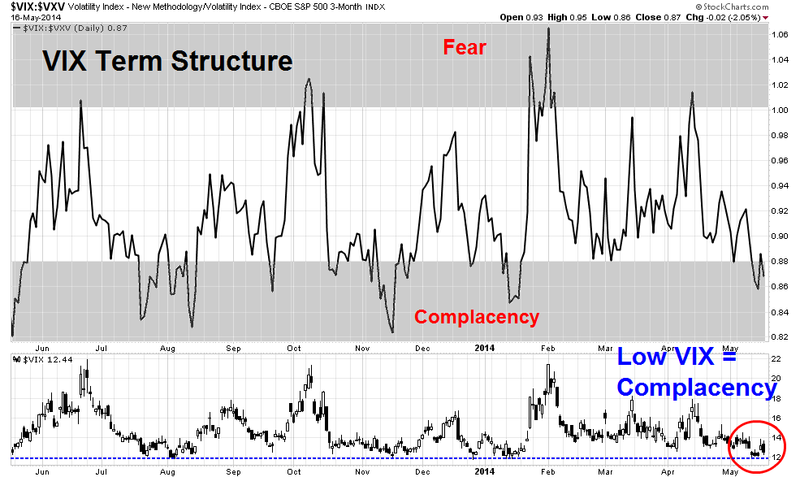 Are the low volatility and level of the VIX a warning of complacency and risky assets are ready to dive? 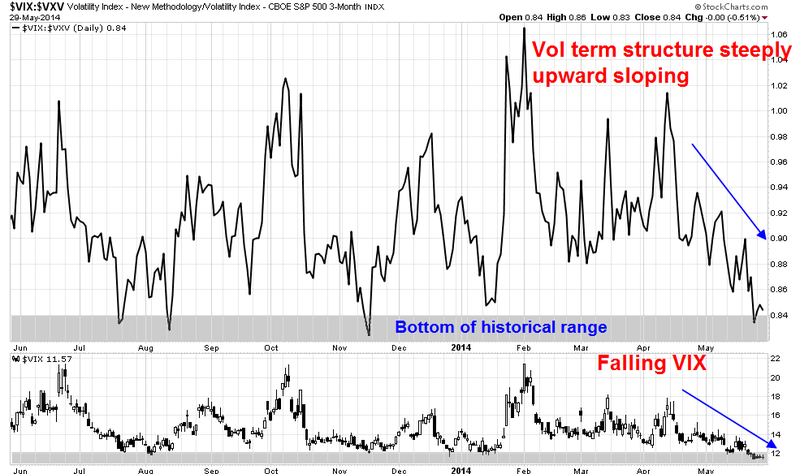 Another way of looking at the signals from the option market is to analyze the VIX/VXV ratio. The VXV ratio is the three-month forward VIX Index. The VIX/VXV ratio is therefore a measure of the term structure of volatility, or the market's expectation of how volatility will evolve over time. A ratio over 1, or inverted term structure, indicates that near term volatility is higher than future volatility and a sign of a high level of angst in the market. By contrast, a low ratio is a sign of market complacency. 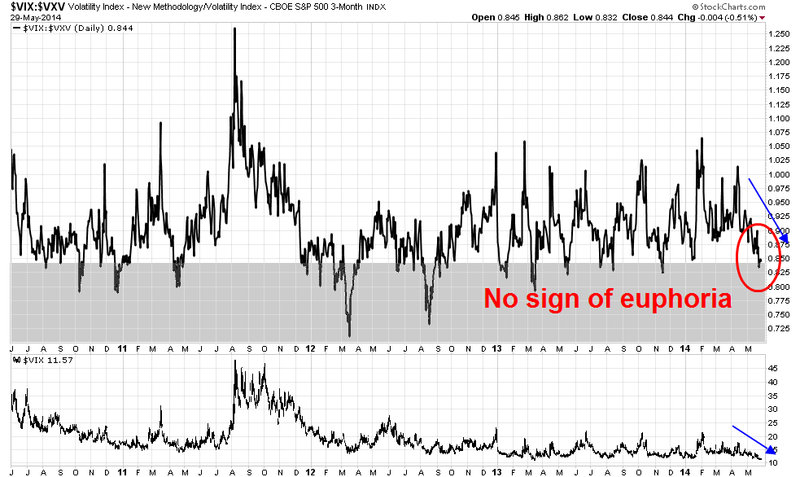 What is the VIX/VXV ratio tell us now? At first glance, the ratio, which is shown in the top panel, is worrying for the bulls. The decline in the ratio mirrors the decline in the VIX Index (bottom panel). Moreover, the VIX/VXV ratio recently breached the 0.84 level, which is at the very bottom end of its one-year historical range. These are all signs of excessive complacency. Before the bears get overly excited, let's take at look at the same chart with a longer time frame. While the VIX/VXV ratio has fallen, its level can hardly be described as at off-the-charts lows and an indication of excessive euphoria. Even if we were to discount the period before 2012, when VIX levels were generally much higher, the VIX/VXV ratio has fallen to these levels several times before and declined to significantly much lower levels in the past. Nothing to worry about, right? Well, not quite. Even if you were bullish on the equity market outlook, I would be a little hesitant about buying at these stock market levels. 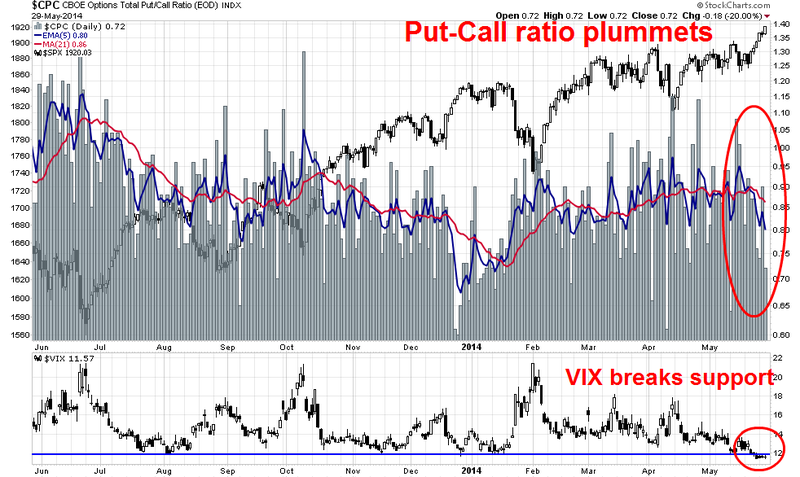 Analysis of the Put-Call ratio, which is a contrarian indicator, shows that the put-call ratio has been plummeting - and that is not a bullish sign over the next few days. 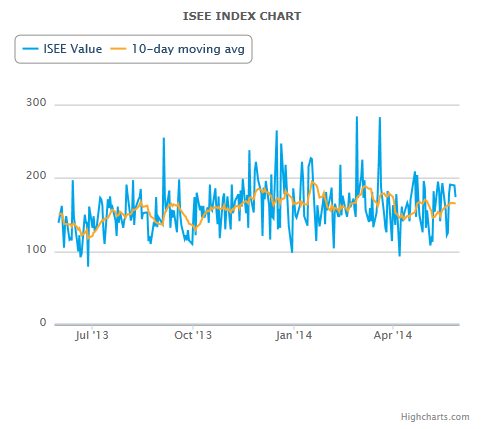 Indeed, the ISEE Index of Equity only Call-Put ratio of open to buy option volume tells a similar story (note that this a call-put ratio and not a put-call ratio) of an elevated level of bullishness among option participants. Bottom line: I would discount concerns about the low level of the VIX Index and focus on the signals from the term structure of volatility. That message suggests that while fear levels are low, they are not so low to cause alarm from a contrarian point of view. While I am not necessarily endorsing a bullish view, bullish traders may want to wait for a short-term pullback as sentiment indicators like the put-call ratio is showing excessive bullishness. One possibly bullish trigger might be for the VIX to rally test the 12 resistance-turned-support level to get long. Investment management: Beyond "He's a terrific stock picker!" If investors don't have time or inclination to manage their own money, then the obvious option is to find an investment manager to manage their assets. All too often, they make the mistake of focusing too much on a manager's past returns or how he achieved his buy and sell decisions during the manager selection process. "Wow! He's a terrific stock picker!" "OMG! He's been incredible at spotting the next emerging trend!" While examining the buy and sell decision is an important part of the process of picking a manager, investors should keep in mind that excellent managers have thoughtful investment processes that do the "little things" right. The existence of a robust investment process is also a sign the manager has taken the time to think about important issues such as risk control, portfolio implementation and creating the organizational DNA to learn from past mistakes. I will not spend time on the first, or the buy and sell decision process. But let me go through 2 to 4, one at a time. There are many fancy names for this step, such as "portfolio optimization". Without resorting to geek-speak, it all boils down to the issue of once a manager has decided on what to buy and sell, he has to decide on how much to buy and sell. It eliminates or minimizes all unintended bets. How do you what is an unintended bet? Let's say that you follow a high dividend yield strategy and find the portfolio overweighted in Utilities. Is that an intended or unintended bet? If it's an intended bet, then you should control the size of the sector bet and not allow the overweight to dominate the portfolio. If it's an unintended bet, then you should market weight Utilities and just buy the highest yielding ones for the portfolio. Risks is multi-dimensional and comes in all shapes and sizes. As any good trader or investment manager will tell you, even though you think that you have portfolio risk nailed down, the market will find a way to hurt you in a way that you will not have anticipated. As a result, how a manager constructs a portfolio will be highly revealing of how he thinks about risk control. In the simplest form, risk may be defined as just absolute loss - and I have met managers who think of risk control purely as where they put the stop-loss orders for their positions. Others will think about risk in other ways, such as in a factor framework (e.g. value vs. growth vs. momentum), diversification (measured by standard deviation and correlation analysis), tracking error against a benchmark (a favorite measure of consultants), macro risk, etc. I would note that since risk is a multi-dimensional concept, managers often think about risk in more than one way. Another risk to consider is governance risk. How do you know the share and bond certificates that you own are genuine? Even if they are genuine, does the governance framework allow you to exercise your rights as a shareholder or bondholder in the way you expect? Will the courts and the government of the day enforce those rights? While these kinds of concerns are more prevalent in emerging market economies, investors with multi-generational time horizons will have to consider these issues as regime changes can and have occurred with regularity in the past hundred years, even in major developed economies. I call this step "portfolio implementation" rather than just trading for a couple of reasons. For one, not all managers trade immediately after making their buy and sell decision. Some have to go through an investment committee and the delay can dilute the effects of the decision. Others have such large portfolios that they could not possibly trade their wish list in a single day without moving the market. Opportunity cost, or the cost of not trading. What if you placed a limit order to buy a stock but the price ran away from you and the trade didn`t get done. You made the right decision to trade, but the limit order prevented you from executing. In effect, there is a trade-off impact and opportunity cost. Smart managers usually have ways to measure portfolio implementation and trading costs. One simple technique is to measure the performance of a paper portfolio against the actual portfolio. The performance of the paper portfolio is based on buy and sell decisions at the time that they are made with no commission or other costs. The difference in returns between the paper and actual portfolio is the implementation cost of the aforementioned three components, which can be then be taken apart with further analysis. I would caution applying the trading cost analytical framework in a simplistic way. There is no one-size-fits-all trading style suitable for all equity managers. You have to tailor the trading style to the reason that you are trading. As an example, classic deep value equity managers tend to be early in their decisions, so it pays to use a patient buy on the bid and sell on the ask trading style. By contrast, momentum traders are transacting on fast decaying information and therefore they should be more amenable to paying up for liquidity in order to trade. Unfortunately, many investment organizations treat trading as an after-thought and assign their most junior personnel to that function. Such a decision is generally a mistake. To illustrate my point, the gap between a median and first quartile manager for a US equity large cap manager is roughly 100 bp when viewed over a 10 year time frame. Supposing that a manager turns over 100% a year (which is admittedly a little high but not a big outlier) but he can squeeze 20bp per trade from optimizing his implementation process. If achieved, this simple step translates to an improvement of 40bp in performance. That`s practically half the distance between the median and first quartile manager. What's more, all this can be achieved without altering the way the other parts of the investment process, such as how the buy and sell decisions are made. The review and control process is one where the manager tries to answer the question of what went right and wrong in past decisions. Good review and control processes are the hallmarks of a learning organization and an organization that is flexible to adapt to changing market conditions. While none of us likes to see poor performance, I have found in the past that my greatest insights come from analyzing negative returns. When you invest in an environment where risk is multi-dimensional, the emergence of a new source of risk or blind spot in the investment process can be revealing about the assumptions you have used to formulate your picks and how you have constructed your portfolio. Many investment organizations engage in some type of attribution analysis. A simple form of attribution analysis for a diversified stock portfolio might be to look for the contributions to performance from sector selection (overweight and underweight decisions) and stock selection. 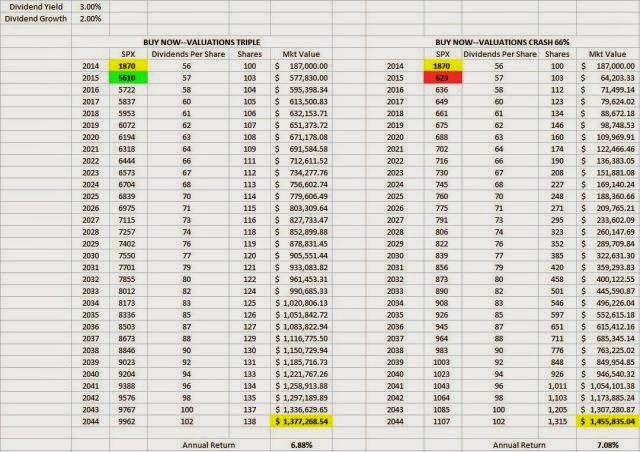 Look for an investment process that goes beyond the simple cookie cutter sector-stock selection attribution analysis spreadsheet template to see if the organization is really trying to learn from their mistakes. A manager had a US large cap equity mandate. His stock selection model analysis showed that he had an excellent stock picking system. Yet, quarter after quarter, the large cap portfolio underperformed in a way that could not be attributed to "bad luck". Attribution analysis of the portfolio revealed that sector selection was mixed, but stock selection showed a negative contribution on a fairly consistent basis, which was in direct contradiction to the return analysis of the stock selection system. After much head scratching, the mystery was solved when analysis revealed that the portfolio experienced poor stock selection in megacap stocks (top 100 stocks by market cap), which comprised roughly two-thirds of the weight of the portfolio and benchmark. In effect, the manager found that their stock selection system was not very effective in megacap stocks, probably because that part of the market is highly efficient, but his stock selection process was much better in picking stocks in the large (non-megacap), medium and small cap arena. As a result of this analysis, the manager took steps to address this issue and learned a key lesson about the effectiveness of his stock selection system. To summarize, the key question an investor wants answered in the review and control process is : "What has the manager done in the past to learn from past mistakes?" It is further revealing of the manager's ability to learn and adapt to market conditions. Beyond "he`s a terrific stock picker!" To summarize, I have outlined some of the basic steps to the manager evaluation process beyond the initial investor response to great past performance and the "he's a terrific stock picker!" reaction. These are some simple steps to assess an investment manager, whether he is an investor advisor who puts together an individual investor's portfolio, a mutual fund manager, or more sophisticated family office or other professional investment organization that offers investment services. To be clear, I am not implying that a manager has to have all of these components in place to be hired. If there is a perceived shortfall in the investment process, it is up to the investor weigh the pros and cons of that manager. For example, an equity manager who uses a research intensive stock picking process and holds a concentrated portfolio of 20-30 stocks will likely not care very much about tracking error against a benchmark (that's for closet indexers!). Analysis might reveal that his tracking error might be as high as 20% (one-standard deviation of 20% variation in return against the benchmark). Such an investment process might be acceptable if the magnitude of manager's stock selection returns overwhelm the riskiness of his portfolio, as defined by tracking error. By contrast, a quantitative equity manager with a highly risk-controlled process who holds a 150-200 stock with a 10% tracking error is likely judged to be unacceptable because of the level of tracking error risk he is taking. Generally speaking, however, if the manager does the "little things" right, it is a sign that he can be a great manager (even if he isn't a terrific stock picker). Time for a growth scare? All the pieces are in place for the U.S. The fiscal drag is fading. Household balance sheets have improved. State and local bloodletting is coming to an end. If not now, when? Indeed, the major US large cap equity averages pushed to new highs last week. The fundamentals appeared positive and supportive of the advance. Notwithstanding any unexpected shocks from the Fed, what really matters to stock prices are earnings. 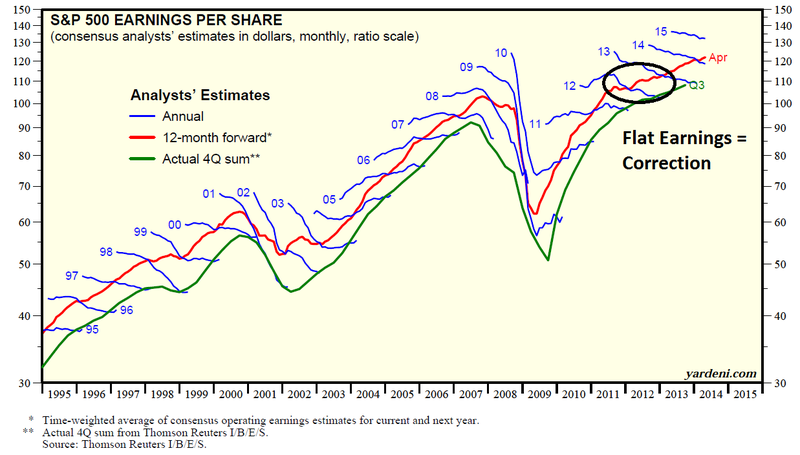 Ed Yardeni`s analysis show that forward 12 month earnings continue to rise, while past periods of flat growth in 2011 and 2012 have been marked by market corrections. 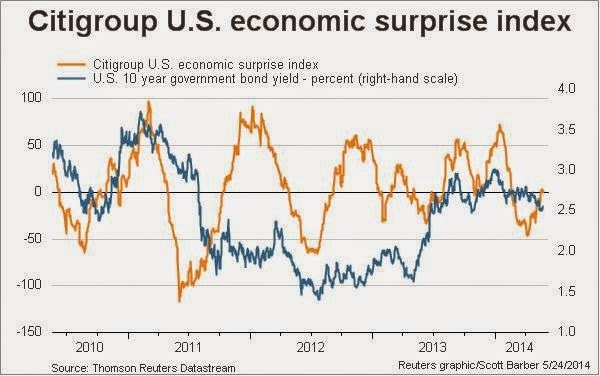 The Citigroup US Economic Surprise Index has been advancing, as the rate of high frequency economic beat-to-miss-rate rise. So far, so good for the bull case. However, there are signs of weakness beneath the surface. Global growth is slowing. 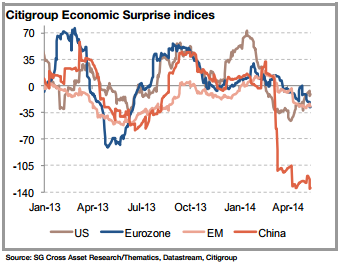 Societe Generale (via Pragmatic Capitalism) showed that the Citigroup Economic Surprise Index has been weak everywhere except for the US. Could a global macro growth slowdown be around the corner? The US economy is in the mid-cycle of its expansion. This part of the cycle "should" be marked by rising employment and consumer spending, as well as increased capital expenditure and capacity expansion. Yet, we have seen scant evidence of the CapEx rebound (see What the equity bull needs for the next phase and CapEx: Still waiting for Godot). The recent CAT report indicating sluggish sales growth continues to be a disappointment in that respect. I have detailed in this blog over the last several weeks the technical concerns I have had about this stock market (see The bearish verdict from market cycle analysis and Market correction or consolidation?). I wrote that one of the key "tells" of the health of this latest bullish impulse is the performance of mid-cycle cyclical and capital equipment stocks. Last week, they cracked, even as the major averages rallied to new all-time highs. 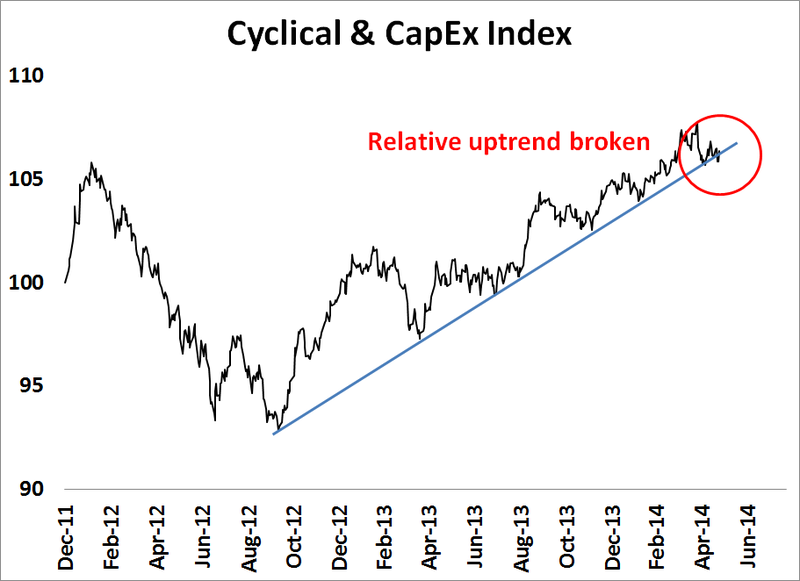 The chart below of the relative performance of the Morgan Stanley Cyclical Index (CYC) show that cyclical stocks have definitively broken down out of a relative uptrend. Up until recently, it could be argued that the relative uptrend was a little wobbly but remained intact. The latest technical verdict from last week's market action was clear. No matter how you manipulate the trend line, the technical break was unmistakable. As confirmation, I constructed an equal-weighted Cyclical and CapEx Index consisting of CYC, Industrial stocks (XLI) and semi-conductor stocks (SMH) and measured their performance against the market. 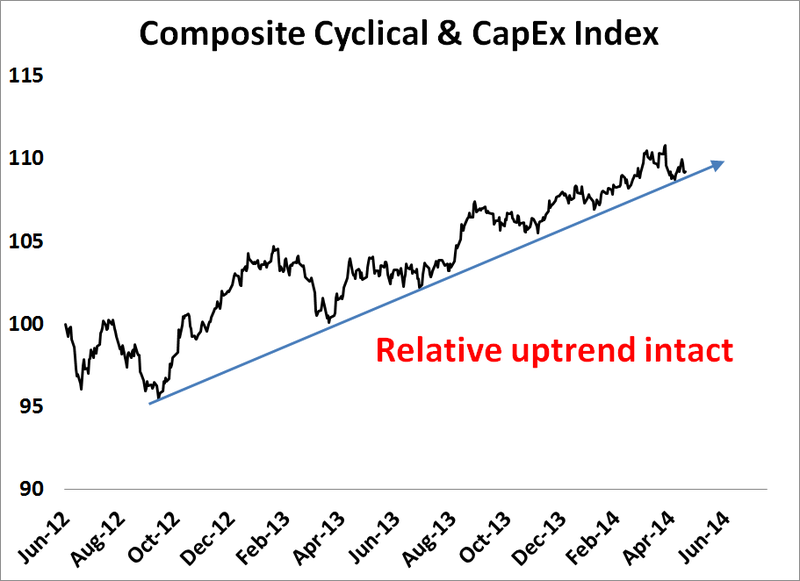 As the chart below shows, this composite index also showed a technical breakdown out of its relative uptrend. In addition, Mish pointed out that Treasury yields have been falling, not rising. While a falling long bond yield could be explained by pension funds buying long duration assets in order to lock in last year's stock market gains (see my previous post A funds-flow reason for equity market weakness), an across the board decline in bond yields is more likely to explained by Mr. Bond Market anticipating economic deceleration, not acceleration. These warning from cyclical stocks and the bond market suggest to me that the US is unlikely to be able to de-couple from the rest of the world. A global growth slowdown will eventually affect the US economy and the markets are starting to price in that possibility. Defensive bear market sectors such as Utilities and Consumer Staples have become the market leadership. Barron’s interviewed Stephanie Pomboy of Macro Mavens this week and she presented an especially bearish view on the US economy. She argues that as the Federal Reserve stops buying Treasuries the economy will falter and the Fed might even taper the taper. She thinks there is little upside to Treasury yields and believes that the 10 year will be trapped between 2 percent and 3 percent for a long time. Is a growth scare just around the corner? If so, we will see the first signs of fundamental deterioration if consensus forward earnings start to get revised downwards. We have already had the warning from the relative performance of cyclical stocks, the next thing to do is to watch the estimate revision rate. The news out of China continues to be mixed. 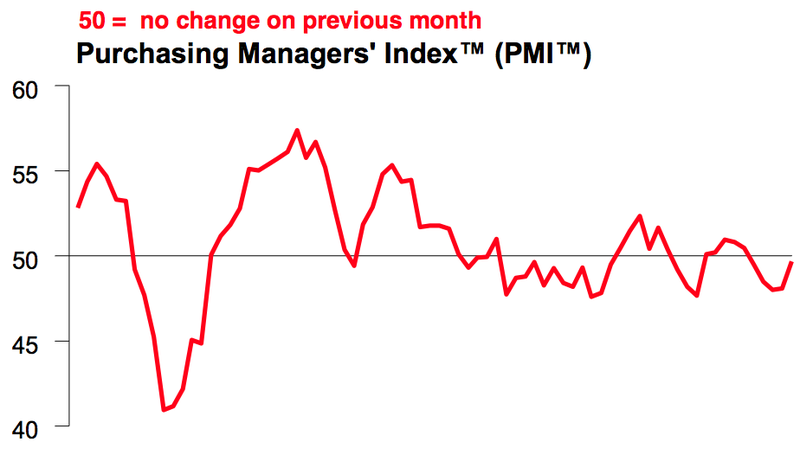 On one hand, the HSBC China Manufacturing flash PMI beat expectations with a reading of 49.7, which was a five-month high suggesting stabilization, but remained below 50 indicating contraction. 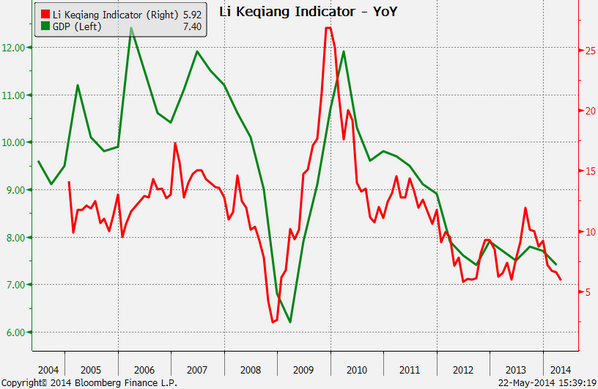 On the other hand, Tom Orlik pointed out that the Li Keqiang Indicator continued to decline, which suggested deceleration. Resource markets, as they are sensitive to both world growth and Chinese demand: Canada (EWC), Australia (EWA) and South Africa (EZA) on an equal-weighted basis. Greater China, defined as China (FXI), Hong Kong (EWH), Taiwan (EWT) and South Korea (EWY), as a way of better measuring the China than just analyzing FXI, which is a somewhat narrow index. 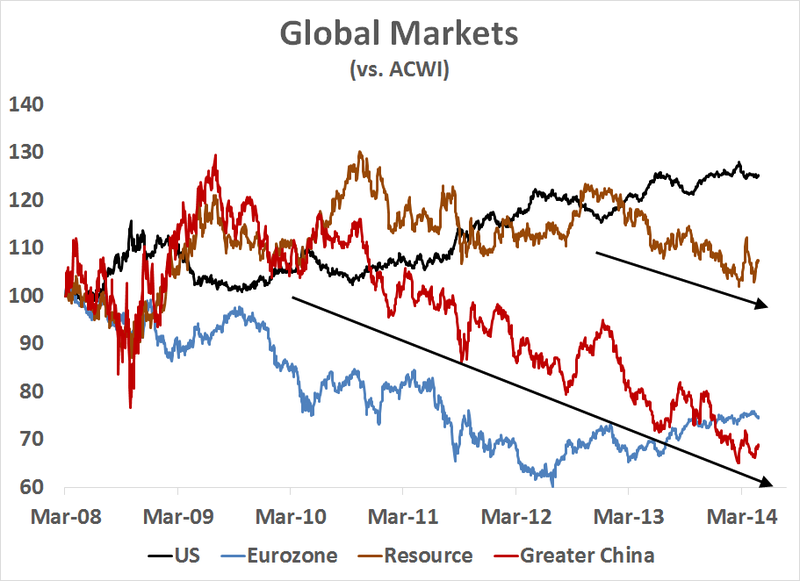 As the chart shows, the US markets have been on a outperforming ACWI since mid 2009 and eurozone equities had been declining but turned around in mid-2012. Greater China has been in a long relative downtrend since mid-2009, indicating a loss of momentum. The resource markets, which are sensitive to both global growth and Chinese demand, had been in a relative downtrend since 2012. If we were to zoom in further, the next chart shows the relative performance of the Resources basket relative to the Greater China basket and Old China (FXI) to New China (FXI), which is heavily weighted in financials, against New China (PGJ), which is heavily weighted towards the consumer-oriented internet and technology sector (see my previous post A New China vs. Old China pair trade). When the lines are rising, Chinese growth expectations are being led by credit-driven infrastructure growth - which is the old formula for growing the economy. When the lines, especially the blue Old vs. New China line, are falling, growth expectations are being led by the new policy of re-balancing growth towards the Chinese consumer and household sector. The latest uptick is expected to be led by the same-old-same-old formula of another round of macro infrastructure spending led stimulus, despite all the official rhetoric. "Currently, the economy is generally stable and we see positive structural changes, but downward pressures are still large and we cannot be complacent," Li said during a visit to the northern region of Inner Mongolia. "We should use appropriate policy tools and pre-emptive fine-tuning in a timely and appropriate manner to help resolve financing strains for the real economy, especially small firms' difficulties in financing and high borrowing costs," he said. Such policy fine-tuning should help maintain "reasonable growth" in money supply and bank credit, he said. 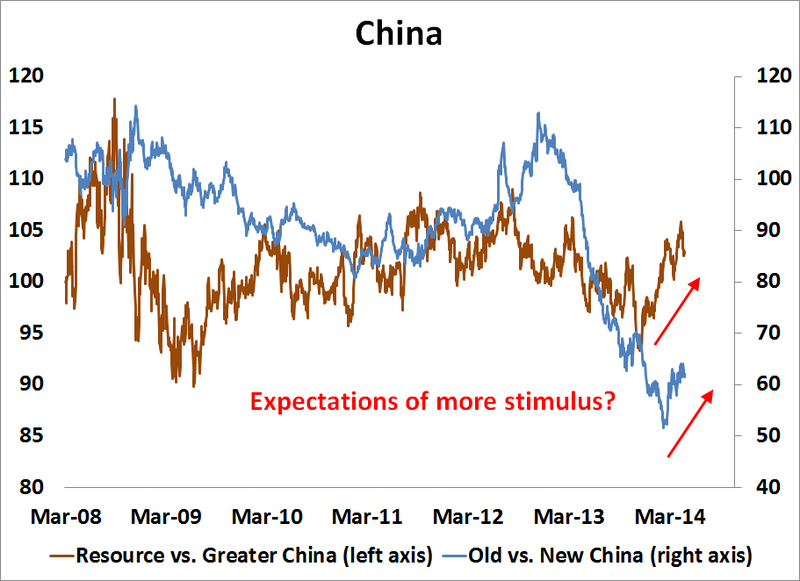 If market expectations are correct, China will not crash, but down that road lies a Lost Decade (see China turns Japanese?). A case of bad breadth? In numerous discussions with technical analysts, I have heard from many people who say that since the Advance-Decline line continues to make new highs, the bull remains alive and stock prices are likely to continue to grind higher. As the chart below shows, the A-D Line (in purple) has not always given warnings of breadth deterioration before corrections. In particular, the A-D Line gave no warning in the correction of 2011. It did move sideways while the SPX rise in the first correction of 2012, but gave no warning in the second correction of 2012. Here is another way of thinking about breadth. Since breadth is designed to measure whether the generals (large caps) are leading the market or if the troops (broader market) are leading the market, then the easy way is to analyze the relative performance of an equal-weighted index against the cap-weighted index. If the equal-weighted index is outperforming and the market is rising, then the troops are leading the charge, which is bullish. On the other hand, if the cap weighted index is outperforming, then it is a sign of narrowing leadership, which can be a warning sign of deteriorating breadth. With that in mind, consider this chart of the equal weighted SPX against the cap weighted SPX (shown in purple). In the period leading up to the corrections of 2011 and 2012, the shaded areas show periods when the equal vs. cap weighted ratios deteriorated before the actual correction. The lead times lasted anywhere from four weeks to nine weeks. To be sure, this measure of breadth did not warn of trouble during the second corrective period of 2012 - in fact, it was rising. Now we are seeing negative divergence between the equal and cap weighted SPX. Should it be construed as a warning? Now consider this chart of the equal vs. cap weighted NASDAQ 100. The pattern was the same as the equal vs. cap weighted SPX chart. We saw the same kind of breadth deterioration in 2011 and 2012 just before market weakness set in. Now even as the NDX is rallying, this breadth indicator is falling - a negative divergence. In short, despite the positive performance of the A-D Line, other breadth indicators are flashing warning signals. Don`t say that you were not warned. Philosophical Economics has an interesting post that posed the question, "Would you be better off if stocks melted up 200% or plunged 67%?" For investors with 30 year time horizons, the counter-intuitive answer is the 66% plunge in stock prices. As equity investors, we tend to focus more on capital gains, but as fixed income investors are keenly aware, there are two other sources of returns for investors. The first source is capital gains, the second is income (interest for bonds and dividends for stocks) and, lastly, re-investment return, or interest on interest. As the analysis from Philosophical Economics shows, if stock prices were to plunge 66%, the investor would be able to compound his returns at much lower prices than if the market melted up. Thus, for investors with sufficiently long time horizons, periodic corrections and bear markets are helpful to terminal wealth value as that dividend income can be re-invested at lower prices. I once had a taxable investor client with an extremely long time horizon. The client was formed as a trust and most of the positions acquired decades ago, e.g. GE with a cost base in pennies. The low cost base of the positions made selling nearly impossible because of the capital gains liability, so the client adopted an investment policy of focusing on companies with a history of good dividend growth. That way, the current beneficiaries could enjoy a steady and predictable rising income stream. Bear markets were especially welcome, as we could "harvest" capital losses to offset the capital gains from the sale of positions with low costs. I had a fruitful relationship with that client, but it was a disconcerting feeling when I called to report our quarterly results when stock prices were rising. I almost felt like I had to apologize, "Sorry, we made you money this quarter. Your portfolio went up by X%." Nevertheless, the strategy of focusing on dividend growth made sense as it should provide better overall returns in the long run for investors with sufficiently long time horizons. It was a good lesson for me in formulating an investment policy statement. Know what you really want. Know your time horizon. My recent post about risk appetite (see It's the risk appetite, stupid!) generated a number of thoughtful reader responses. They mostly went something of the sort, "I have done similar forms of inter-market analysis as yours and my results show..."
The results were varied, but they were suggestive of a flat range-bound market rather than the correction that I have been looking for in the several weeks. I am therefore contemplating an alternative scenario where stock prices stay flat in a choppy trading range and this post is mainly an exploration of that possibility. Indeed, the SPX has been trading in a relatively narrow range since early March and has frustrated both bulls and bears alike. Longer term, however, the index remains in an uptrend. In comparing the methodology for my Risk Appetite Index (long NASDAQ, Russell 2000, short Consumer Staples, Utilities and Telecom) to the Risk on/Risk Off techniques used by my readers, I found a variety of different components and weightings. While the components were not all that different from a thematic viewpoint, different weightings appeared to lead to different conclusions about market direction. Early cycle: The economy is in recession or on the edge of a recession. In response, the central bank stimulates the economy with low interest rates (or unconventional policy). As a result, stock begin to rise, led by interest sensitive sectors, such as Financial and housing related stocks. Mid cycle: Some analysts split this part of the cycle into several pieces, but here is roughly how market expectations change. The economy gets better, or is perceived to get better. More jobs are created and consumers have more money to spend. Corporations find that they start to get capacity constrained. They respond by hiring more people, which leads to a virtuous cycle of more consumer spending, and buy more capital equipment. During this part of the market cycle, Consumer Discretionary, capital equipment sensitive sectors like Technology and Industrial stocks lead the market higher. Bear phase: The stock market falls because of the expectations of higher interest rates and falling growth. Defensive sectors such as Consumer Staples, Utilities and Healthcare outperform during this phase. I am describing a market cycle and not an economic cycle. Realize that this framework is based on technical analysis and not economic analysis. A market cycle behaves like an economic cycle, but it only describes the market response to expectations, not the actual economic result. As an example, the economic cycle started at the trough of the Lehman Crisis in 2008-09, but I believe that the market cycle actually began in late 2011, when the markets got over the trauma of the debt ceiling impasse in Washington and the ECB acted to relieve the pressures of the eurozone crisis with its LTRO program. As the market cycle evolves, the leadership baton gets handed from one sector or group to another. I will not beat a dead horse and talk once more about why I think stock are going to correct. Rather, I would like to focus mainly on what is going right. To review what is happening, early cycle sectors like financials and homebuilding stocks have rallied but have faltered. Consumer oriented mid-cycle sectors like the Consumer Discretionary sector have also weakened, though the corporate mid-cycle names have wobbled and their leadership position is shaky. Meanwhile, late cycle (Materials and Energy) and defensive sectors (Utilities, Consumer Staples and Telecom) are all turning up. Indeed, the relative performance of equities (SPY) to the US long bond (TLT) is suggestive that equity performance is losing steam. What's more, momentum is starting to roll over. The chart below shows the NYSE Summation Index, overlaid with a slow stochastic. Note how the index is starting to turn down, which has been a signal for corrections in the past. When I examined the bull case, I did find some pockets of strength. Notably, the mid-cycle cyclical and capital goods sectors of the market are still holding up relatively well. As an example, the Dow Jones Transportation Average made a new high last week, as did the Dow Jones Industrials Average - Dow big signal. When I boil it all down, it comes down to the performance of the cyclical sectors. If I had to watch one chart as a key "tell" for the market, it would be the relative performance of the Morgan Stanley Cyclical Index (CYC) against the market. 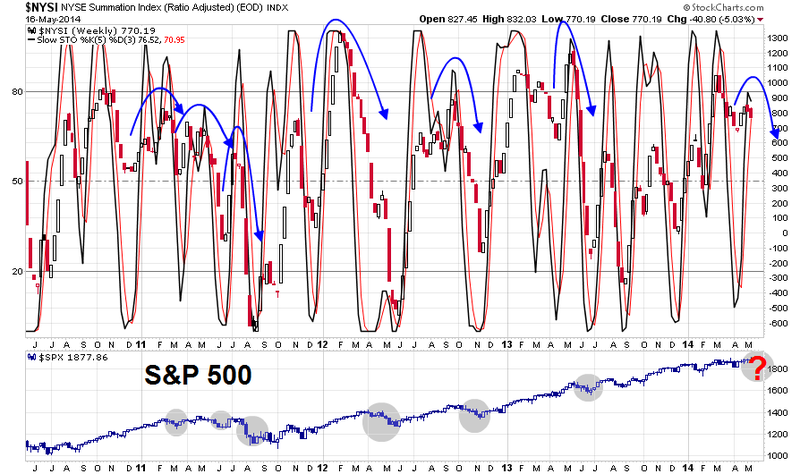 As the chart below of the CYC/SPX ratio shows, cyclical stocks remain in a wobbly relative uptrend. Depending on how you draw the trend line, this ratio has either violated the relative uptrend or has experienced minor violations of the relative uptrend. Indeed, a Cyclical and CapEx Index, consisting of an equally weighted position in CYC, Industrial stocks (XLI) and Semiconductor stocks (SMH), relative to the SPX shows the relative uptrend to be intact. Since we have not seen any definitive violation of this relative uptrend, stock prices are likely to trade in tight narrow range. In effect, Mr. Market remains cautiously optimistic about the outlook for an acceleration in capital expenditures, which has not been forthcoming (see my recent posts What the equity bull needs for the next phase and CapEx: Still waiting for Godot). In short, the choppy range-bound market would be the result of a battle between the negative technical factors (see A case of risk exhaustion?, Interpreting a possible volatility regime change, Should you sell in May? and The bearish verdict from market cycle analysis) and optimism about the cyclical effects of CapEx spending, which provides the hope for the next round of earnings growth. Collapsing home builder stocks and fading real estate data. A US dollar on the verge of ripping to the upside. Treasury bonds refusing to back down, nudging their way higher daily. A deteriorating number of new highs for individual stocks as the indices flirt with record levels. Huge divergence between small caps and large caps. “The last time I saw anything like this was in 1994, when the Dow and the SP 500 were in a 10% trading range all year, and then under the surface they were just ripping them apart. I have a sick feeling that we might be doing that again,” he said. I'm not saying go short. Just don't go too friggin long. There are really two scenarios to consider for the summer months. Either stock prices correct or they remain in a choppy trading range. In either case, the upside is limited and the risks are skewed to the downside. So just don`t go too friggin long. China's President Xi Jinping recently likened China to a sleeping lion: "China is a sleeping lion. Today, the lion has woken up. But it is peaceful, pleasant and civilized." Here is something for you to consider over the weekend. 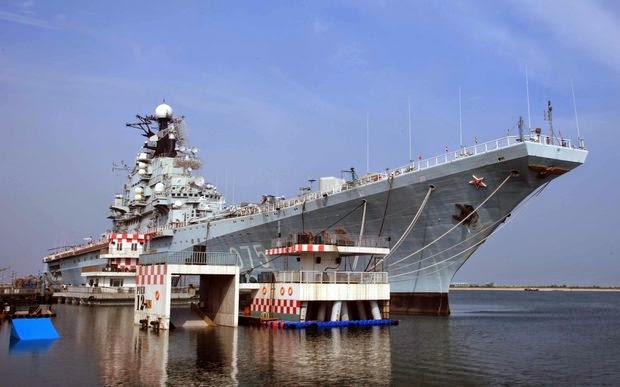 As foreign affairs pundits have wrung their hands over the geopolitical implications of the territorial dispute between China and Vietnam, the Philippines, Japan and others, you have to consider how aggressive the Chinese are when they have converted the former Soviet aircraft carrier, the Kiev, into a floating hotel. Greed is good. Greed is right. Greed works. I've been seeing some odd and contradictory readings from the option market all week. One screams "fear" while the other screams "complacency". On one hand, the equity put-call ratio, which I highlighted on Sunday night (see Watch for the sentimental rally), remains elevated and is suggestive of a high level of fear. Such a condition is contrarian bullish for equities. The chart below shows the 5 day exponential moving average of the equity only put-call ratio (in blue) and the 21 day moving average (in red). Both are at elevated levels relative to their own recent history. By contrast, the VIX and its term structure are sending out a completely opposite message. The top panel of the chart below shows the VIX term structure measured as a ratio of VIX to VXV, or three-month expected volatility. When the ratio is above 1, it means that the term structure is downward sloping, the option market is showing a high level of fear. By contrast, if the ratio is low, indicating that the term structure is steeply upward sloping, it is an indication of complacency. 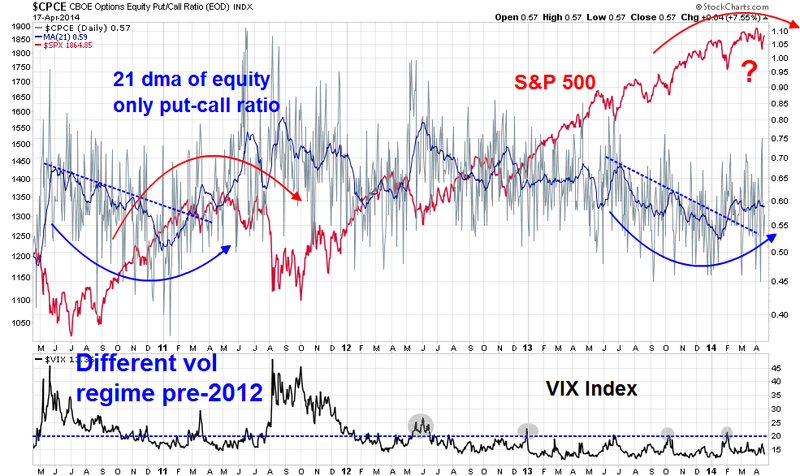 Here is the puzzle: When the equity put-call ratio is showing a high level of fear, why is the VIX structure in the complacency zone? The bottom panel shows the VIX Index. If the markets are so fearful, then why is this so-called "fear index" so low? Might this dichotomy in put-call and VIX pricing be part of that process? In that case, an elevated put-call ratio relative to its own recent history could be a signal of rising volatility, rather than just rising fear. 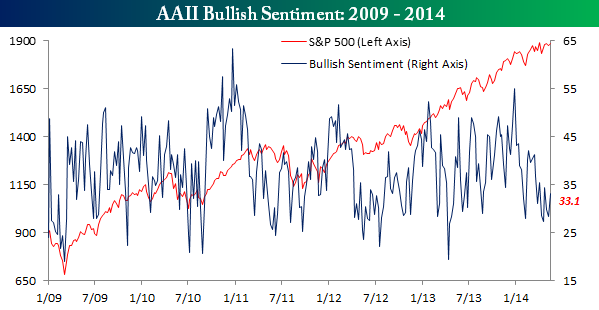 Indeed, the latest AAII sentiment readings (via Bespoke) could be a clue of a volatility regime change. Even though the major large cap averages made a new high, AAII bulls rose from 28.3% to 33.1% this week, but they remain low on an absolute basis, which would normally be interpreted as bullish. 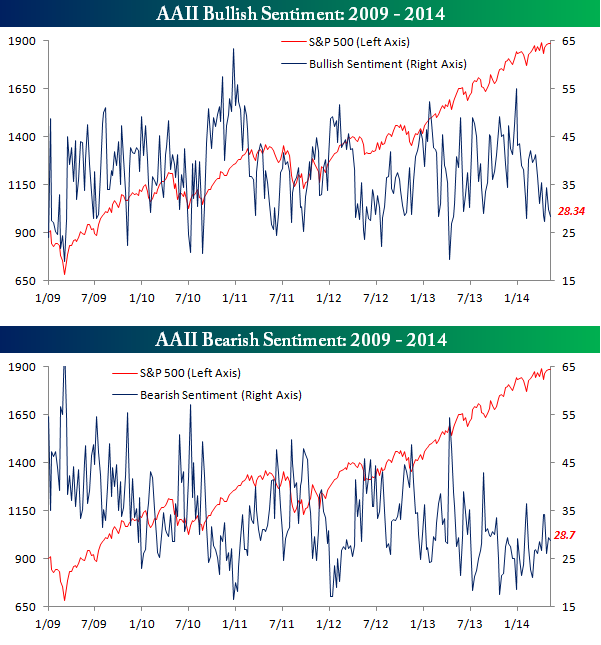 However, the AAII survey readings from the previous week also show a very low level of bulls and bears alike. I interpret these conditions as a highly jittery market. These are clues of a market ready to move to an environment of higher volatility. I haven't written much about China lately, but I continue to get questions. So I thought that it was time to summarize my big picture thoughts on China here. There is much to cover so I will just go through the highlights. 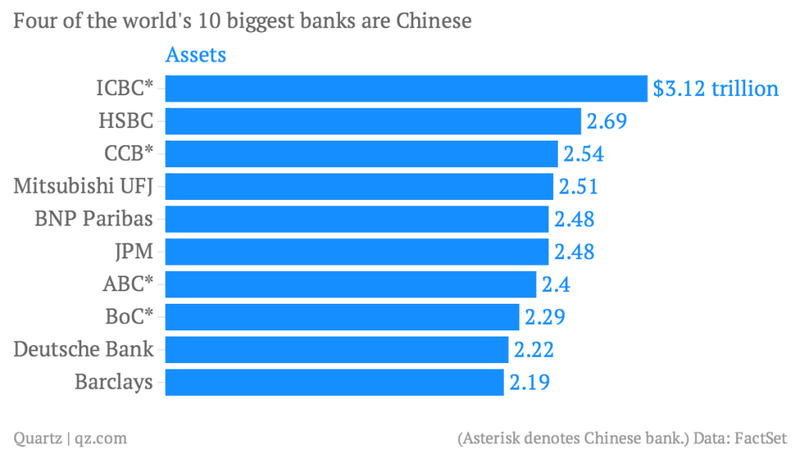 There is no question that the risks are rising in China. The best analogy is someone riding around on a motorcycle at 100mph without a helmet. It doesn't mean that anything bad happens to you. It just means that if you got into an accident, the results won't be pretty. While most of the debt remains denominated in RMB and therefore China is unlikely to experience a significant currency crisis in a debt crisis, the global financial system remains vulnerable as recent BIS data shows nearly USD 1 trillion in external foreign currency denominated debt. Note that the data only goes to March 2013 and the reading was USD 880 billion. At that rate of increase, it would not be a big leap to imagine that total external foreign currency debt has topped USD 1 trillion today. 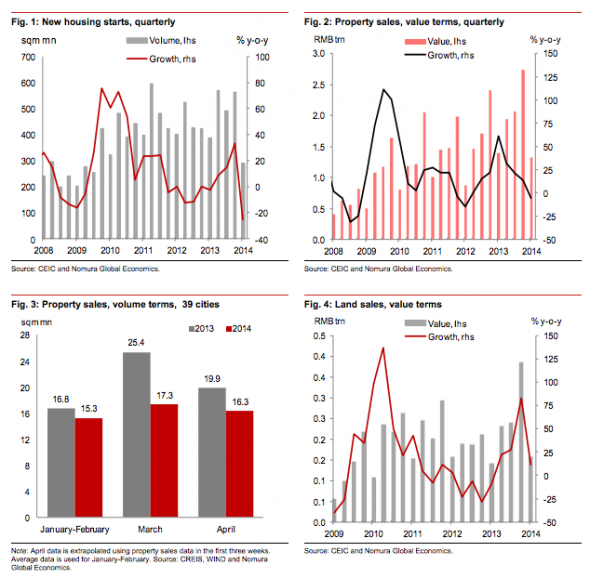 They’re from Nomura’s latest on China property stress which, they say, is increasing at pace. Apparently every property market leading indicator at the national level turned down in Q1, and for most monthly indicators the rate of decline accelerated through the quarter. That, says Nomura, means the question is no longer “if” or “when”, but rather “how much” China’s structurally oversupplied property market will correct. What happens if property prices crash? 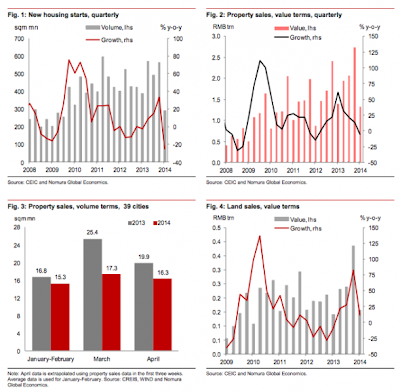 Property prices remain the linchpin of the Chinese financial system. Unlike lending in the West, which is based on the principle of whether the borrower has sufficient cash flow to service debt, Chinese lending is based on assets, or collateral value. That's because income statements can be somewhat *ahem* flexible and creative about the sources and levels of cash flow. If you can't trust cash flow and believe in asset values, then real estate is solid, right??? The greater risk to China lies in the pervasive consequences of any property bust. Property investment has grown to account for about 13 per cent of gross domestic product, roughly double the US share at the height of the bubble in 2007. Add related sectors, such as steel, cement and other construction materials, and the figure is closer to 16 per cent. The broadly defined property sector accounts for about a third of fixed-asset investment, which Beijing is supposed to be subordinating to the target of economic rebalancing in favour of household consumption. It accounts for about a fifth of commercial bank loans but is used as collateral in at least two-fifths of total lending. The booming property market, moreover, has produced bounteous revenues from land sales, which fuel much local and provincial government infrastructure spending. The reason things look different today is the realisation of chronic oversupply. As the property slowdown has kicked in, housing starts, completions and sales have turned markedly lower, especially outside the principal cities. Inventories of unsold homes in Beijing are reported to have risen from seven to 12 months’ supply in the year to April. But when it comes to homes under construction and total sales, the bulk is in “tier two” cities, where the overhang of unsold homes has risen to about 15 months; and in tier three and four cities, where it is about 24 months. More so, the bet is that the property market is just waaay too important and connected to be allowed to correct aggressively. As ASY says, as property transactions slow, more and more liquidity is trapped in the sector, and this inevitably leads to financial failures and knock-ons everywhere else — downstream industries, local government revenues, collateral for bank lending and via wealth effects on consumption to name a few specifics. As UBS note, given that property investment accounts for almost a quarter of fixed investment, construction value-added is 13 per cent of GDP, and there are extensive linkages between property and industrial sectors including steel, cement and construction machinery, the impact on the economy from a drop in construction volume is bigger than that from a worsening household balance sheet and consumption. Nomura estimate that property investment (including residential, commercial and public housing) contributes to around 16 per cent of GDP, taking into account its direct contribution and that of related industries such as steel and cement. Not a sector to ignore, in other words, particularly as the property correction could snowball in the short run. This is the kind of bumpiness in the road that the motorcycle rider will have to navigate. Instead of worrying about whether the rider will crash, Beijing has opted for a long-term solution of reforming the system to allow China to better deal with shocks - sort of building the right kind of road, so to speak. The leadership in Beijing recognizes the risks to China`s growth model. They have made commitments to reform the system. The latest Five Year Plan calls for re-balancing the source of growth from infrastructure driven growth to consumer driven growth, financial reform and greater mobility from the reform of the hukou system of residency. These tensions may drive a process of ‘skewed reform’. For example, the rapid growth of the shadow banking system constitutes de facto reform of the banking system as depositors can obtain higher returns than that available from banks. But this increases risk. The shadow banking system has led to systemic issues, such as a rapid increase in debt levels and complex links with the banking system. Limited regulation has led to poor governance and risk disclosure. It has increased moral hazard as investors unaware of the real risks rely on state owned banks or governments to ensure return of their capital. Little is likely to change. At the March National People’s Congress, a meeting to rubber-stamp policies, Premier Li Keqiang conceded as much. While stressing the government was committed to structural reforms, he admitted investment remained “the key to maintaining stable economic growth,” targeted at 7.5%. Policy implementation will remain challenging. Local governments are unlikely to acquiesce to reforms that undermine their power, which is rooted in rapid growth built around property development using cheap land, mispriced utilities and low taxes. The rebalancing in favor of consumption brings the central government into direct conflict with powerful vested interests that have benefitted from the credit-fueled, investment-based growth model. As the process left households and ordinary workers with a relatively small share of GDP, economic rebalancing will require transferring an increasing share to this group at the expense of state-owned enterprises, banks and the economic elite. In effect, reform requires an implicit redistribution of wealth, encoded in the language of reform — financial market liberalization, reform of state-owned enterprises, and labor mobility. This means that any reform agenda will, in all likelihood, face significant opposition from vested interests in the state sector and local government. 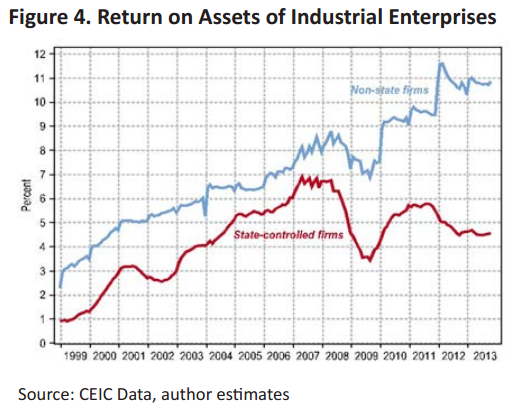 That chart from SocGen shows that even as the state sector continues to leverage up — among industrial enterprises, the liability-to-asset ratio of SOEs jumped from 57 per cent to 61 per cent between 2008 and 2010, and continued to crawl up afterwards — non-state entities saw the ratio falling all the way from 59 per cent to 56 per cent. Combine that with a low inflation environment — April inflation data came in notably below expectations and a low inflation environment has persisted for about two years — and a very large negative output gap, you get an argument for a debt-deflation scenario, at least in some sections of the economy. I was digressing. All this talk about a building better road is all fine and good, but what about our story of the rider on the motorcycle riding at 100 mph without a helmet? The most likely scenario is that should the motorcycle rider crash, he will be revived - but as a zombie. Second-largest economy. In 1968, Japan unseated West Germany (paywall) as the second-biggest economy on the planet. China seized that title in 2010, with its nominal GDP of $5.9 trillion nudging past Japan’s $5.5 trillion. One-tenth of global GDP. By the early 1990s, Japan’s economy accounted for 10% of global GDP (in purchasing-power parity terms, via the IMF), a milestone China hit in 2007. One-tenth of global trade. In 1986, Japan accounted for 10% of global trade, a level China reached in 2010. Japanese banks had traditionally loaned against the value of assets, not the income those assets generated; a property deed was considered the most reliable collateral, explains Wood. That policy came in handy as Japan’s capital markets took off. With big companies relying more on the stock market for funding, banks had to find new customers: smaller companies. 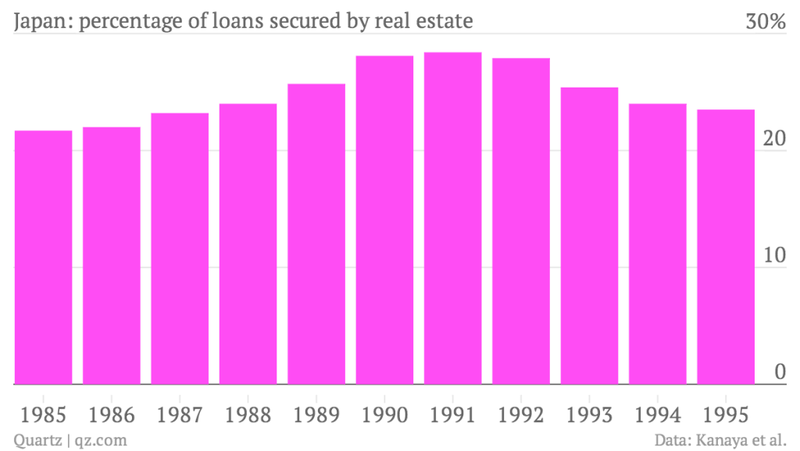 Less familiar with these new firms, banks used property as collateral for credit. Soaring property values invited bigger and bigger loans. But because property prices had gone up every year since the end of World War II, banks thought their loans were safe. If the motorcycle were to crash, the market-oriented policy is to allow the rider to die. The Chinese leadership has been unwilling to embrace that idea and history has shown that whenever the economy slows or shows signs of stress, Beijing capitulates and comes to the rescue and take steps to socialize losses, which would be counterproductive to their goal of reform, because it would be household sector that would ultimately pay the price (see Will Beijing blink yet one more time?). In our motorcycle analogy, it is the equivalent of reviving the corpse and making him into a zombie by lending to and propping up failed enterprises as the Japanese banking system did throughout their Lost Decades. With China’s stock market already mired in its epic slump, the thing most likely to trigger a Japan-style crisis is a real estate market collapse. However, China already exhibits more than a few symptoms of a zombie infection. Even without the catalyst of a market crash, it in many ways already seems more like Japan in the late 1990s than the Japan of 1989. 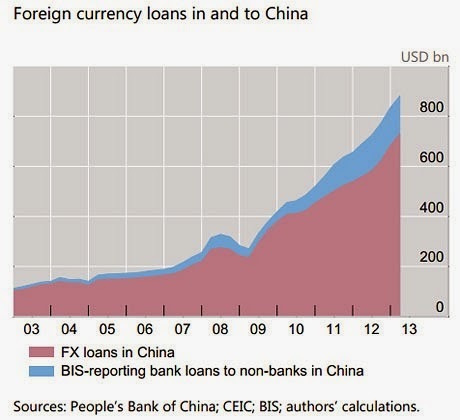 Though lending continues to surge, it’s getting harder and harder for China to grow. 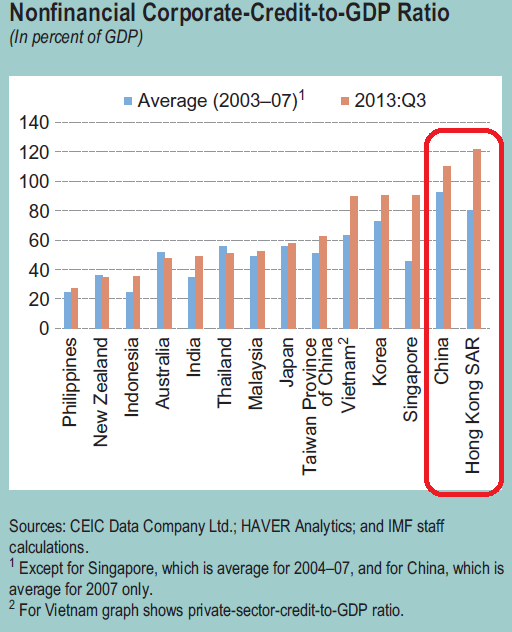 In 2013, credit rose 10% annually (paywall), much higher than the 7.5% expansion of official GDP. That trend is worsening: China must invest twice what it did in 2008 to generate the same amount of GDP growth, according to Wei Yao, an economist at Société Générale. By her tally, China now owes the equivalent of 38.6% of its GDP in principal and interest each year. But growth won’t revive until credit starts supporting the right businesses or industries. Even though state-owned enterprises (SOEs) tend to be much less profitable than private firms, the big banks are also state-owned. And because China’s credit system is still based on political, and not market, risk, the big state-owned banks still loan to SOEs over smaller companies. 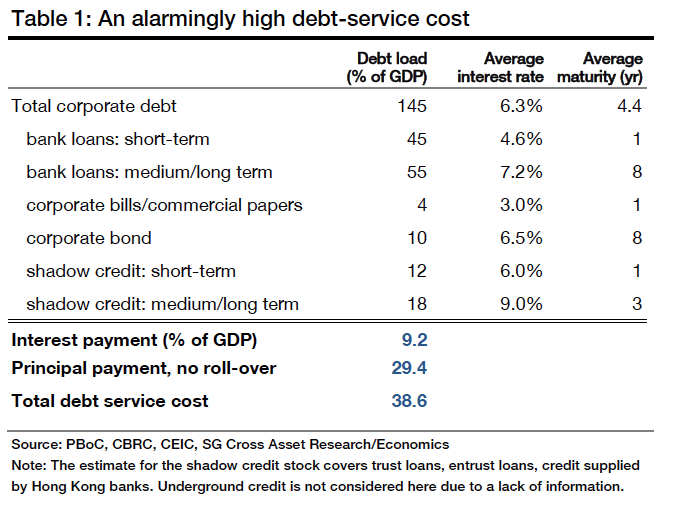 If we treat the debt of SOEs and local government guaranteed corporates just as government debt, China’s situation is, to some degree, similar to the post-Lehman US: rising public debt, declining private sector leverage. Particularly, the state sector as a whole generates sub-par economic return. Loss-making industrial SOEs account for more than a quarter of total industrial SOEs, double the ratio among non-state industrial enterprises. Granting credit to profitless corporates is not too much different from having quantitative-easing liquidity trapped in the commercial banks’ vault. China's authorities are becoming increasingly nervous as the country’s property market flirts with full-blown bust, threatening to set off a sharp economic slowdown and a worrying erosion of tax revenues. New housing starts fell by 15pc in April from a year earlier, with effects rippling through the steel and cement industries. The growth of industrial production slipped yet again to 8.7pc and has been almost flat in recent months. Land sales fell by 20pc, eating into government income. The Chinese state depends on land sales and property taxes to fund 39pc of total revenues. The Chinese central bank has ordered 15 commercial banks to boost loans to first-time buyers and “expedite the approval and disbursement of mortgage loans”, the latest sign that it is backing away from monetary tightening. Japan’s experience explains why the challenges facing the Chinese economy are actually much greater even than avoiding a housing market crash or a financial crisis. China’s leaders may well be able to steer the country clear of either. But pulling off yet another miracle of administrative legerdemain will be perilous if it means China’s leaders further postpone financial reforms—things like lifting the deposit-rate cap, allowing SOE failures, or permitting foreign banks to compete. One thing Japan’s history makes painfully vivid is that the longer China waits, the larger its zombie horde grows. With the Chinese leadership implicitly signaling to the market the existence of a Beijing Put for the Chinese economy, China is unlikely to see a crash landing. The price for such a policy is a prolonged period of slow growth. 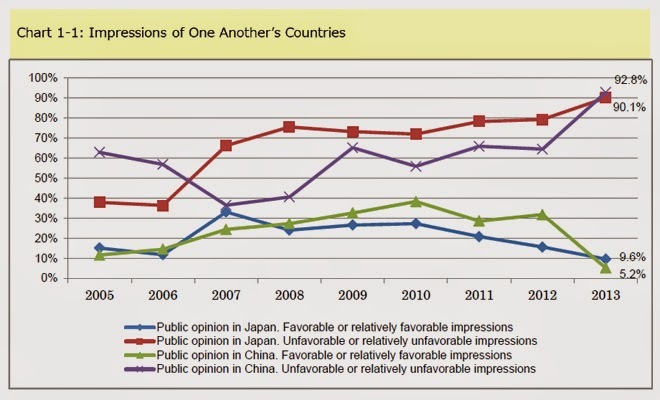 In other words, China is likely to turn Japanese. Just don't tell either the Chinese or Japanese that, they hate each other. It`s the risk appetite, stupid! Indeed, looking across the 38 occasions, the next 20 trading sessions averaged a gain of 1.9% and the next 50 sessions averaged a gain of 3.51%, with only a handful of losing instances in each case. Now, my conclusion is not to jump in with both hands and buy this market. Rather, the data exercise has accomplished two things: 1) tempered my bearish leaning; and 2) illuminated the kind of market we are in. I find this to be true of data exercises in general. They offer a kind of perspective that checks assumptions and biases and can trigger new ideas as well. The historical perspective is not always the correct perspective, but it often is a fresh one--and there is value in examining one's assumptions critically. I would agree with Steenbarger. My own view of breadth indicators is that while they can provide warnings of negative environments for stocks, they are not precise timing indicators. I showed that the corrections of 2011 and 2012 were not accompanied by breadth deterioration in the Advance-Decline Line (see Should you sell in May?). My cautiousness about the stock market is related to broad based indications of the loss of risk appetite across the board (see The bearish verdict from market cycle analysis). However, I do agree with the evidence based approach used by Steenbarger to test his conjectures about markets. In that spirit, I have constructed a Risk Appetite Index, consisting of an equal weighted long position in the high-beta segments of the market, namely the Russell 2000 (IWM) and NASDAQ 100 (QQQ), coupled with an equal weighted short position in defensive sectors of Consumer Staples (XLP), Utilities (XLU) and Telecom (IYZ). 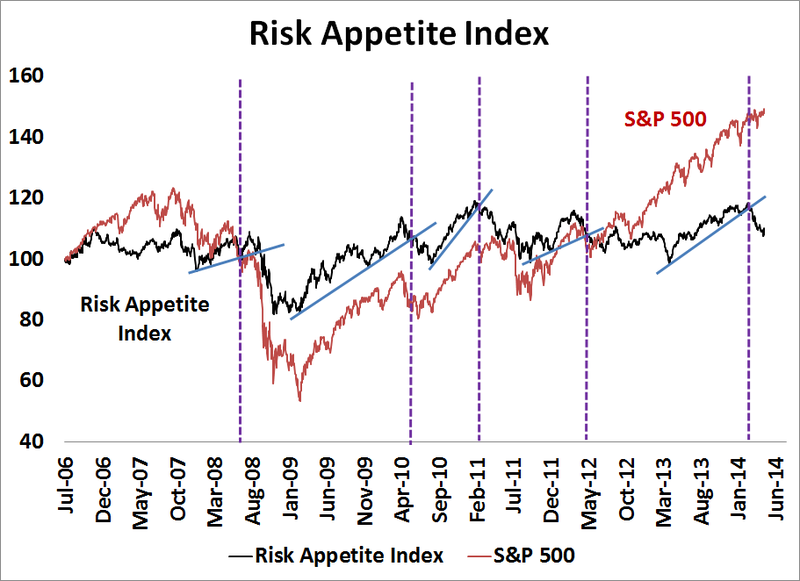 The chart below shows the Risk Appetite Index (in black) and SP 500 (in red). There were four past instances of trend breaks in the Risk Appetite Index, where the breaks were marked by the dotted purple lines. In three of those instances (2008, 2011 and 2012), stock prices either entered a bear market (2008) or corrected (2011 and 2012). On one occasion (2010), stocks failed to decline, but that can be partly explained by the fact that they had already corrected. Now we have a trend break in the Risk Appetite Index, not just in US equities, but marked by the underperformance of European small caps against large caps and a loss of appetite in credit markets. Despite the new highs achieved by the major US large cap equity averages today, which I believe was a short-term sentiment-driven rally (see my previous post Watch for the sentimental rally), I continue to find it difficult to get overly bullish on US equities over the summer months. Financial engineering as a CapEx substitute? A warning from the retail investor?